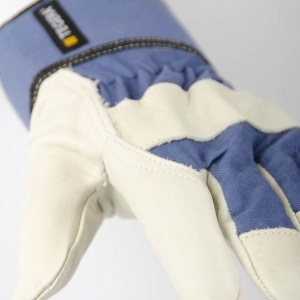 When working with rough materials, it's vital that you have gloves made from strong, hardwearing materials. The Ejendals Tegera 105 Heavy Work Gloves are heavy work gloves composed of durable full grain cowhide. 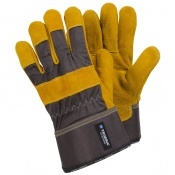 With reinforced fingers and thumb, the Ejendals Tegera 105 are suitable for a variety of heavy duty applications. 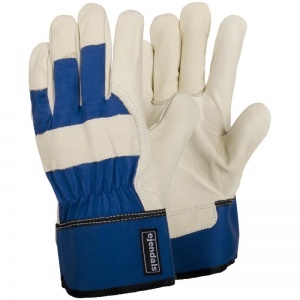 The Ejendals Tegera 105 Gloves do not feature a lining and are supplied in a blue/beige design. 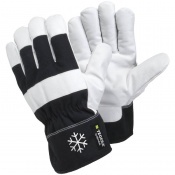 The product code for these gloves is 105. The table below showcases the test results of the Ejendals Tegera 105 according to EN388 Mechanical Risk specifications. The Ejendals Tegera 105 are offered in five different sizes, the dimensions of which can be found below. 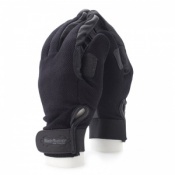 To measure your hand, measure the circumference of your hand around the knuckles (excluding the thumb) with your hand open and your fingers together.